Having an earthquake warning system on everybody's cell phone is sort of the holy grail of seismic civil defense. It appears that we're halfway there. On Friday, scientists at U.C. 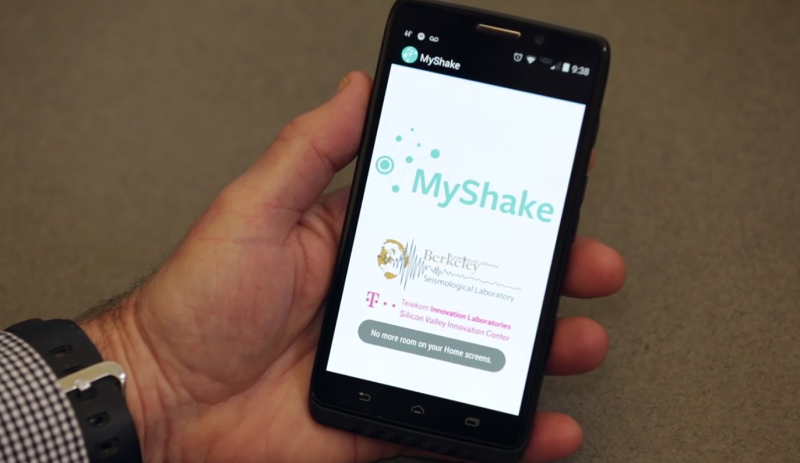 Berkeley unveiled MyShake, an app that makes smartphones an extension of the seismic detection and reporting network that's already in place. "The idea of MyShake is to use phones to record the earthquake as well as push out information about it," says Richard Allen, who directs the U.C. Berkeley Seismological Lab. At first glance, the idea would appear to leapfrog current efforts to test a workable warning system for earthquakes in California, but the app doesn't yet turn that information around to provide personal warnings prior to the shaking. "This is a citizen science research project at this point," cautions Allen. "We still have to put this out on many phones, we have to test the algorithms we have, and see how good it is at actually detecting the earthquakes and then estimating the locations." The app takes advantage of accelerometers already built into every phone, the gadgets that sense movement and direction. The algorithm, developed by grad student Qingkai Kong, is designed to distinguish between earth movement and, say, dancing to techno music with the phone in your back pocket, and can pick up initial vibrations from a magnitude 5 or greater quake. Meanwhile, the phones will add a potentially dense layer of sensors to the existing statewide network, which Allen describes as "high-quality" but relatively sparse. The current network has about 400 highly sensitive sensing stations, most clustered near heavily populated areas. By contrast there are something like 16 million cell phones roaming around California in people's pockets and purses. "Cell phones are never going to replace that traditional network," says Allen, "but we think that cell phones can contribute to it here in California." Eventually, he says a phone-based warning system could save lives in countries with no other warning networks in place. "Generally when we push out warnings, we want them to go over every media that we can come up with," says Allen. "Phones are clearly are a very a important one; people have phones with them all the time, night and day." Given how long it often takes to make a simple phone connection on a crowded cellular network, it's hard to imagine that phones could be a useful warning device when fractions of seconds count. But Allen says the lab's testing has shown that warnings could be turned around and dispatched in "a few tenths of a second." For users relatively close to a temblor's epicenter, seconds is typically all the warning they get with current technology. 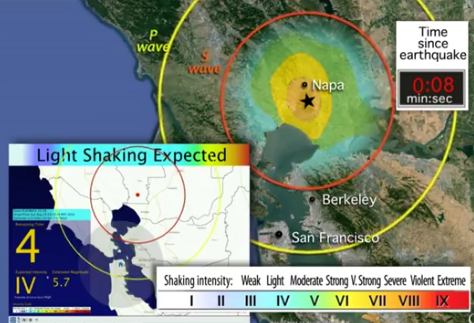 When a magnitude 6 quake shook the Napa Valley in August 2014, people testing the PC-based ShakeAlert system in Berkeley got about eight seconds' warning to duck and cover. "In the future we hope that MyShake -- the phone recordings -- could contribute to ShakeAlert, but we have research to do before we get to that point," says Allen. For researchers to know the true potential of the phone-based system, Allen says thousands of people will need to download the app. "The more people who download, the more quickly we'll get to the point where we could use it," he urges. One impediment to that: MyShake is launching with only the Android version for now. Allen says the intent is to follow with an app for Apple iPhones but he can't say how soon that will happen -- that an iOS version requires a whole separate development project.